My friend Michelle turned me on to RAW – a section of Boston.com dedicated to amateur photographers in New England. 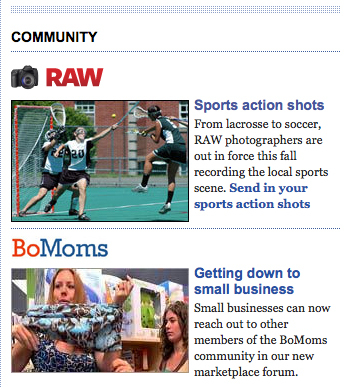 I’ve submitted a few pictures, one for Fall Foliage, and another for Sports Action Shots… Michelle just shot me an email and told me that my picture was on the front page of Boston.com (which I thought she meant the RAW section) and I went crazy, but couldn’t find the shot. After I couldn’t find it, I sent her a note and she clarified for me: it’s on the FRONT PAGE of Boston.com! Well, that’s kind of cool, no, that WAY cool! It’s one of my favorite action shots and it’s nice that it’s being used to feature that section. Just in case, I’ve included the image here, I know how fluid these websites are and I just wanted my 15 seconds of fame ;). I also entered last month’s contest for “Close Ups”, I’ll let you know if mine gets picked as the top 50 so you can vote for me!